So if you have been following my Twitter feed you know about the current state of the stock on Knob Creek. 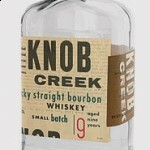 If you haven’t been reading it here is more info on what happened with Knob Creek. When I checked my email today I saw an email from Knob Creek with the subject of: “Thanks for nothing” and below is the content of that email. Because you’re such a dedicated friend and loyal consumer of Knob Creek® Bourbon, we wanted you to be the first to know about some big news here at the distillery. For the first time ever, we’ve actually run out of Knob Creek. Because you and your fellow Stillhouse members have done such a great job sharing your love of Knob Creek and spreading the word far and wide, consumer demand for our bourbon has finally outstripped our current supply. And we’ve got nothing left to bottle until November. So, from the bottom of our hearts, thanks for nothing. Of course, we could bottle the next batch a little early to make up for the shortage, but we believe Knob Creek must be aged a full 9 years in order to reach its true potential. So we’re just going to wait it out. If you happen to experience a shortage where you live, just remember that everything will be back to normal this November. We’ll be in touch soon. And again, thanks for nothing.